Jill and her three children joined Family Promise in December of 2015. It was apparent from the beginning that she would use Family Promise as a resource to achieve her goals of getting a job, obtaining an apartment, and organizing her son’s surgery. Jill showed so much motivation upon entering the program that later in December Jill and her children moved into one of Family Promise’s St. Vincent DePaul apartments just in time for Christmas. Due to Jill’s lack of stability with housing, Jill’s son was not able to have a necessary surgery, but in January because they were living in one of Family Promise apartments he was able to have the operation. 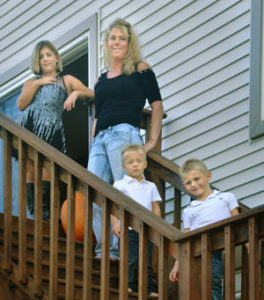 After her son’s surgery, Jill continued to apply for jobs and look for apartments. Then in March Jill got approved for an apartment and moved into their new home on April 1st. Shortly after moving out, Jill obtained a job as a waitress. As a result of Jill’s perseverance, Family Promise provided her with rent assistance so she and her family could have a smooth transition in their new home. Family Promise is happy to say that after helping Jill with 2 months of rent assistance, she and her children continue to live in their apartment, Jill is gaining fans as a wonderful waitress, and her son was able to have his second surgery.